Is peanut butter good or bad for people living with diabetes? What is the daily average amount of carbs for a person living with diabetes? Does diabetes have an effect on a person's state of mind and spirituality? Is it important to have a variety of foods in your diet or is it ok to eat the same things on a daily basis? There's not a lot of choices in the morning. Is it ok to have protein powder for breakfast? 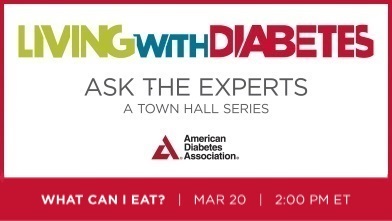 The American Diabetes Association® has created Living with Diabetes: Ask the Experts, a free, educational Town Hall series focused on diabetes management. The series provides information and tips for living well with diabetes, including taking medication, eating healthy, planning meals, monitoring blood glucose, getting active, coping with common feelings about the disease, managing stress, and getting support. Focused on a specific topic, each session features streaming video and a live 45-minute Q&A with Association diabetes experts. Open to all, participants can listen and ask their question online or on the phone. The series kicked off on June 28 and runs monthly through March 2018. Register for individual Town Hall sessions at diabetes.org/experts, call 1-800-DIABETES (800-342-2383), or text EXPERTS to 828282 to sign up for the series. What can I Eat? : Learn about how to make realistic food choices that not only fit into your life with diabetes or pre-diabetes but also make you feel better and improve your blood glucose.